Ultimaker 3D Printer: Best in Shootout for overall print quality. Although Ultimaker’s second offering recently celebrated its first birthday, its performance in our Shootout was head and shoulders above the rest of the FFF machines. This is a great machine for those who want to load a model and print without spending hours setting up and tweaking parameters, but it still gives the advanced user enough control to get even more out of the Ultimaker 2. Ultimaker also maintains its own integrated 3D-printing ecosystem, with an online model library at YouMagine.com and web-based modeling tool UltiShaper 3D. The Ultimaker 2 ships almost entirely pre-assembled and ready to go. Simply remove the (awesome) glass build plate from its protective bubble wrap, and secure it with the premounted aluminum clips. Snap on the filament holder, power it on, run the leveling procedure, load the filament, and this bot’s ready to go. Bed leveling is performed manually using the familiar “paper thickness” ritual, and onboard menus on the OLED screen quickly guide the user through the process. While auto-bed leveling would be a welcome feature, the 3-point system (versus a 4-point system where two knobs must be adjusted in tandem) works very well and the adjustment knobs turn smoothly, making fine-tuning a breeze. – Reduce printing speed for small parts or tweak settings in Cura to set minimum layer time. – Use a glue stick to keep large overnight prints adhered to the platform — brims and rafts can be difficult to remove. – Back filament from hot end manually (heat nozzle, move material, remove tube and trim before executing “change filament procedure”) to avoid melted chunks jamming filament feed. Best in Shootout print quality. Killer heated glass bed is perfect for PLA prints, also works well with ABS, Bridge Nylon, PETT and T-glase. Beginner-friendly software, but also offers complete setting control. Onboard controls allow for fine-tuning of temp and speed settings midprint. Models are prepared for printing with Cura, Ultimaker’s open-source software, and files are written directly to an SD card. Software configuration is simple: Just select your printer from a list of preconfigured options. For those who want to just load a model and print, Cura’s default streamlined “Quickpoint” mode displays three basic print quality options: fast, normal, and high quality. More adventurous users can switch the software into “Expert Mode,” which opens up a multitude of tweakable settings. Normal mode works great for most prints, but it can be a bit fast for smaller models. Prints are run directly from a computer SD card using the onboard controls. Using the stock settings, this printer was at the head of the pack for most of our test prints, notably those that tested the physical stability of the machine. Tests with lower scores, such as the Overhang and Bridging prints, were hurt by the aggressive speeds and could be vastly improved with some minor tweaking. 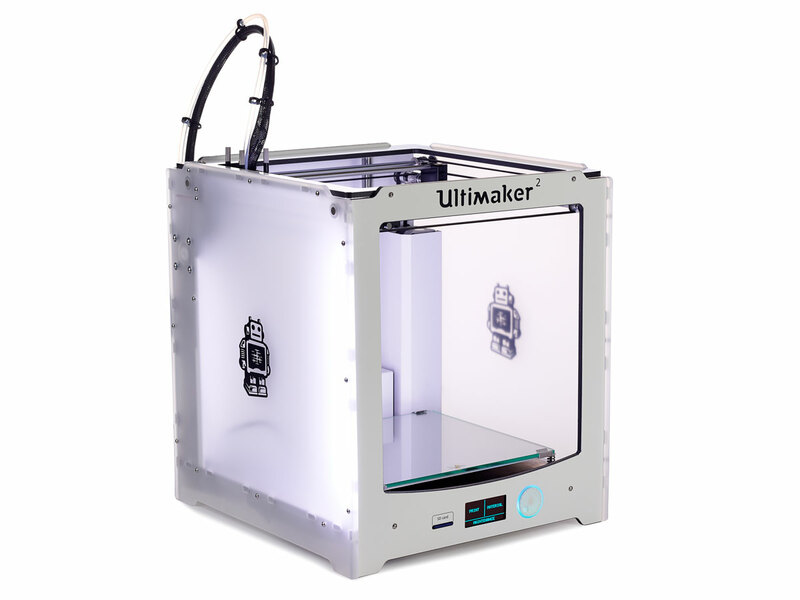 The Ultimaker 2 has all of the features one should expect of a class-leading printer: a heated glass build platform, illuminated build area, onboard controls, two PLA cooling fans, with a frame that is sturdy and attractive. It’s also OctoPrint compatible, so wireless printing (and slicing via Cura) is possible with the user addition and setup of a Raspberry Pi and a wi-fi dongle. Absent from this feature list is an autoleveler and second extruder, which though in development, was not yet available as of press time. If a dual extruder is on your immediate must-have list, then you may want to wait. However, Ultimaker has always included a spot in their extruder carriage for the possible addition of a second one, so upgrades of this machine are feasible. One has to dig deep to find things not to like about the Ultimaker 2. During the Shootout, we had two thirds of the build area LEDs fail (I told you, we’re digging deep). Feeding material into the extruder can be tricky and the fans on the hot end assembly are a little loud — unfortunate for this otherwise quiet printer. Ultimaker was responsive when we anonymously contacted their support about the faulty LED strips, offering advice to troubleshoot and replacement units. Makers on a tight budget may want to look elsewhere, but few machines can beat the Ultimaker 2’s combination of high-quality, hassle-free printing with easy-to-use software and an attractive, compact package.